I visited the Amazon Store today, its first permanent bricks-and-mortar rollout. The store falls under the purview of a former Amazon co-worker from back in the day who I admired very much. It's really a lovely place. It seems to have captured a lot of the charm of what Barnes & Noble used to be like, before they lost their way, with a very strong whiff of Seattle and a sense of appreciation of the book as a form. That, even with Kindles, Fires, an Echo, and much more centrally located and throughout the store. This is a book bookstore that happens to have some electronic gear and electronic aids. The entire store feels like the front part of a bookstore. There is no back crammed with spine-out books and remainders and weird stuff—and even used books in various conditions. 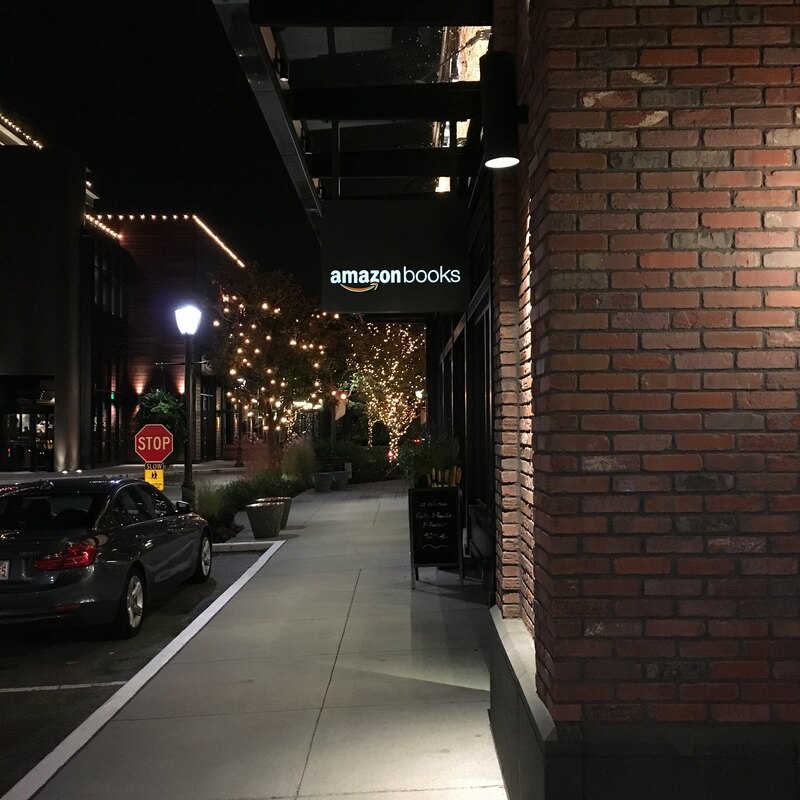 The back of the bookstore is the Amazon ecommerce operation. Amazon is self-showrooming. The crowdfunding campaign to produce a second anthology of work from The Magazine failed to fund: we reached about 60% of the target, but I believe getting people on board was trickier this time for a variety of reasons, including that we are about to halt regular issues of the publication. However, we have a couple hundred copies remaining of our Year One hardcover anthology that were printed in April of this year. It's a great collection of about 25 stories across a huge range of topics. It's cloth-covered book with a dust jacket, and a full-color interior. We'd still like to create a second anthology, and selling down our inventory of the first-year collection would go a long way to letting us figure out that plan. I'll write a full post-mortem about this campaign in the near future. More lessons learned, but not bad ones at all. So we lasted as long as we could while turning a buck so that I could make an increasingly smaller portion of my living from it, while enjoying the heck out of working with so many great writers and publishing stories about so many people and things, historical and present, geeky and sweet, sad and hilarious. It's been great. Our last subscription issue will be December 17, 2014, after which we will discontinue and refund subscription on a pro-rated basis and may produce some ebooks or special projects thereafter. But in the meantime, we're going to go out with a bang by producing another beautiful offset hardcover book drawn from our second year in publication, which we're celebrating today. Funding this Year Two book means we can pay all the writers reprint fees and get their work and the stories of people they tell out to a bigger audience, too. We're also giving away the digital editions of the Year One book to help raise awareness of this new project, and we're pledging — if funded — to give away the digital editions of this new collection as well! Several years ago, I said I would no longer publicly comment about my time in 1996–1997 as Amazon.com's catalog manager. Why? Because my knowledge and memory were so out of date, and I did not keep a journal during that period. It would be silly for me to provide commentary about a company that I had only been with during a period of explosive growth—now no more recently than 14 years ago. However, an essay in today's Wall Street Journal called "Jeff Bezos of Amazon: Birth of a Salesman," compels me to comment on one aspect of the pervading myth of Amazon's creation and early years. You can read elsewhere about the truth behind other parts of the creation myth, especially in Robert Spector's fine and exhaustive look at Amazon's early years, Get Big Fast. The part that got me was the door-as-desk myth, which has been cited since Amazon's founding as a way in which the company confounded standard business practice and was frugal during its very early startup days. This is a complete crock, and I would suspect that no one associated with the company, including Jeff, ever necessarily put forth a cost savings for these ersatz desks. In the very early days of the company, I'm sure the doors made more sense. They had very little room or time, and were trying to husband cash. Doors have a large surface area relative to most desks, and Amazon was in a garage and then a couple of industrial/warehouse spaces before they split the warehouse (down south of the viaduct) and the offices (in the heroin district of Seattle near Pike Place Market) before I joined. I had met Jeff Bezos through mutual friends in 1995, when I was already running a Web development firm, hosting several companies, in downtown Seattle. He and I got along quite well, and I was always encouraging. My business was already profitable and growing, but I knew from the early days I didn't have the kind of entrepreneurial drive to embrace the risk—and sell myself—to turn the firm into something huge. I was looking for successful-boutique scale, and more or less achieved that. I had lunch with Jeff in October 1996 when I was a bit in the doldrums about what I was going to do next with the business. He invited me to join Amazon, which I did. But what I remember most was, after lunch, walking into his office in the Columbia Building, and seeing a rack of blue colored shirts, his trademark at the time, and the door-as-desk. I laughed. I looked at the threadbare carpet and spartan furnishings, and said, "Investors must love this." He gave me his patented laugh. "These desks serve as a symbol of frugality and a way of thinking. It's very important at Amazon.com to make sure that we're spending money on things that matter to customers," said Bezos, 34. "There is a culture of self-reliance. (With the low-tech desks) . . . we can save a lot of money." The doors were expensive, built to an arbitrary height, heavy, difficult to move, and horrible for body health because of the bad ergonomics. That's when I started having to see an acupuncturist for carpal tunnel and related problems. And also note that these were exterior doors: moving a exterior door through an interior door frame with legs permanently attached is a tricky task. At the time, a slightly smaller desk (or even a sturdy banquet table) would have cost 1/3 to 1/2 the amount and worked far better. Jeff was and is a brilliant marketer. The marketing and perception of the door-desks was much more important than their actual savings to the company. Hey, I wrote a book! Hey, I suffered for months to make it reality! Hey, it's reality!! It's in print! Crazy. 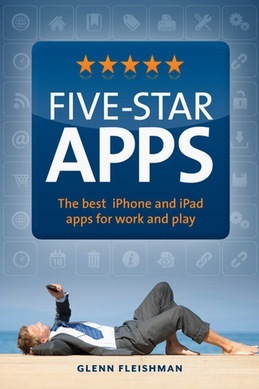 Buy a copy (compare at online booksellers)!Five-Star Apps ($20 retail, about $13.50 online) has nearly 200 reviews of the best and most useful and most fun iPhone, iPad, and iPod touch apps that I examined. Reviews are supplemented with screenshots, since it's often hard to know what a program looks like in real use since you can't get demo versions (only "lite" programs). You can follow links at 5str.us to buy the book!